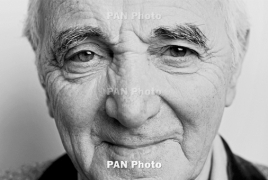 PanARMENIAN.Net - Charles Aznavour’s house-museum opened in downtown Yerevan today (June 1), in a solemn ceremony attended by the legendary singer, his son Nicolas Aznavour, President Serzh Sargsyan and a number of guests. Minister of Culture Armen Amiryan handed the symbolic keys to the museum to Charles Aznavour. Charles Aznavour was born in Paris on May 22, 1924, the son of Armenian immigrants from Turkey. His artistic parents introduced him to the world of theater at an early age. He dropped out of school at the age of nine, already aspiring to the life of an artist. He began to perform at this time, and soon took the stage name "Aznavour". His big break came when the singer Edith Piaf heard him sing and arranged to take him with her on tour in France and to the U.S.
Aznavour's voice is shaded towards the tenor range, but possesses the low range and coloration more typical of a baritone, contributing to his unique sound. Often described as the "Frank Sinatra of France", Aznavour sings mostly about love. He has written musicals and about a thousand songs, and made more than one hundred records. Aznavour speaks and sings in many languages, which has helped him perform at Carnegie Hall and other major venues around the world. He also recorded at least one song from the 18th century poet Sayat Nova, in Armenian. In 1974 Aznavour became a major success in the UK where his song "She" went to Number One in the charts. At 85, Aznavour is in excellent health, although admittedly 60 years on stage have made him "a little hard of hearing". He still sings in multiple languages and without persistent use of teleprompters, but typically sticks to just two or three (French and English being the primary two, with Spanish or Italian being the third) during most concerts. On 30 September 2006, Aznavour performed a major concert in Yerevan, the capital of Armenia to start off the cultural season "Arménie mon amie" in France. In 1998, Charles Aznavour was chosen as Entertainer of the Century by CNN and users of Time Online from around the globe. He was recognized as the century's outstanding performer, with nearly 18 per cent of the total vote, edging out Elvis Presley and Bob Dylan. He has sung for presidents, popes, and royalty, as well as at humanitarian events, and is the founder of the charitable organization Aznavour for Armenia. The BAFTA awards were held on February 10. The full list of nominees with the winners is indicated in bold.